Warning: spoilers for last night’s Arrow episode are ahead! With the exception of only a few appearances in Season 2, Malcolm Merlyn has played a major character on Arrow, from being its main antagonist to occasionally allying with Team Arrow. However, so far in Season 4 he hasn’t had much to do beyond providing exposition and worrying about Thea’s well being. That changed last night in "Sins of the Father," which saw Malcolm not only lose almost everything, but return to being a full-on villain. Following up on last week’s episode “Unchained,” Nyssa al Ghul tried to convince Oliver to kill Malcolm in exchange for The Lotus, the magical potion that could cure Thea. Oliver in turn convinced Malcolm to instead relinquish control of the League of Assassins for the cure, and while it looked like he was game for the exchange, it was all a ruse for him to kill Nyssa and her forces, kicking off the briefest of civil wars within the group. That led to the (surprisingly quick) rooftop duel between Oliver and Malcolm, Oliver substituting for Nyssa because he’d rather her not die than Malcolm. 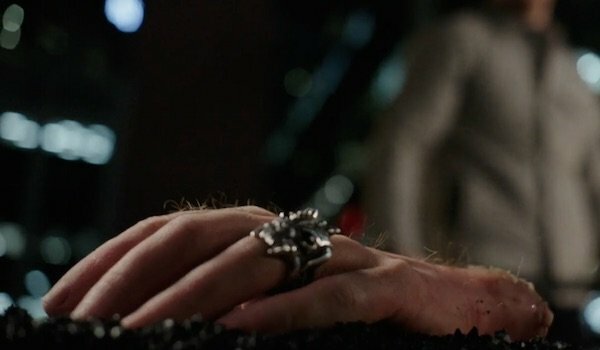 In short order, Oliver had Malcolm at his mercy, but rather than kill him, he sliced off his left hand and gave his ring to Nyssa, making her the new Ra’s al Ghul. Considering that Marvel have been the ones cutting off a lot of hands in recent years (as their own homage to Star Wars), it was surprising to see a DC adaptation take a page from that book. Losing an appendage is bad enough, but adding insult to injury, that same power Malcolm just lost was wiped away when Nyssa disbanded the League of Assassins. So not only is Malcolm out a hand (and an army of ninjas), only hours later, he watched his former glory melt away, figuratively and literally. Enraged to a level we haven’t seen in a while, Malcolm swore revenge on Oliver and allied himself with Damien Darhk, telling the Season 4 big baddie about Oliver’s son in Central City, William. Yep, there are no shades of grey at work here. Malcolm wants Oliver to suffer for his betrayal, even if means allying with the closest thing Arrow has to “the devil.” More importantly, that moment may have provided addition foreshadowing about the flash forward, and not just with Oliver’s son being outed. Oliver tells Barry Allen at the mysterious grave that he’s going to kill “him,” and in the follow-up from “Blood Debts,” an engagement ring-less Felicity echoes his sentiments concerning this individual. Many have been under the assumption that Oliver is referring to Darhk, but what if Malcolm is actually the target of his wrath? If Oliver discovers that Malcolm is responsible for the death of this loved one, whether it’s William, his mother Samantha or someone else, then nothing is going to hold back his rage against his sister’s father. That leads to the next question: is Arrow setting up Malcolm’s exit? One of the themes in last night’s episode was whether people can truly change. Felicity’s experience with her father led her they can’t, while Oliver still has hope for some people. Time and time again Malcolm has had opportunities to make amends for his crimes, and while he has helped Team Arrow with several problems, he’s never truly payed penance. After “Sins of the Father,” it’s not unreasonable to see Malcolm as irredeemable, and if that’s the case, then his feud with Oliver and the other protagonists is going to end in bloodshed, and it’s likely much of that blood will be his. As mentioned earlier, Malcolm hasn’t had a lot to do on Arrow lately, and while he’s certainly one of the show’s better villains, it doesn’t look like there are many more paths to take him down. Killing him off, whether at Oliver’s hands or someone else’s, would finally conclude his four-season journey and let Arrow kick off a new era. We’ve seen him as the villain, we’ve seen him as the opportunist anti-hero, and now we could finally watch his final bow, either as the villain or, on the off chance he is capable of redemption, doing a selfless act before taking his last breath. Malcolm just entered a new stage of his life, and it will be interesting to see where the writers take him, but one thing’s clear for now: he’s mad as hell and will have his vengeance! You can catch new episodes of Arrow Wednesdays at 8 p.m. EST on The CW.